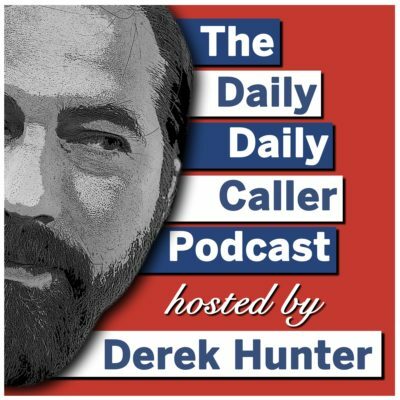 A daily look at the news in politics and pop culture with the Daily Caller's Derek Hunter. On today’s show, we get into the media’s gradually forming narrative of the Mueller Report before Thursday’s release. We also discuss New York Democratic Rep. Alexandria Ocasio-Cortez’s unmatched ability a fool of herself again, left-wing journalists drooling over “Mayor Pete” even he doesn’t seem to understand the Constitution and another movie version of an old TV show in the works. On the one year anniversary of The Daily Daily Caller Podcast, we talk about the fire at Notre Dame Cathedral in Paris and why the damage is not as bad as it looked like it could have been, how Independent Vermont Sen. Bernie Sanders released his very telling taxes and the Mueller Report’s expected release date this week. Lastly, we take a quick walk down memory lane. Before that we get into the interview, we cover the arrest of Julian Assange, the continued liberal freak-out over the attorney general looking into the origins of the hoax Russia investigation, and how Democrats are upset over a Washington Post story about the Trump administration considering releasing illegal aliens in sanctuary cities. Today’s show delves into the liberal outrage over Attorney General William Barr’s announcement that he will be looking into the origins of the Russia investigation. It’s weird how leftists — particularly journalists — are angry at the prospect of someone trying to get answers to the basic questions of how this whole thing started and whether or not it was politically motivated. Today’s show covers a lot of ground. Israeli Prime Minister Benjamin Netanyahu was reelected, anti-Semite and Minnesota Democratic Rep. Ilhan Omar is Newsweek’s cover girl, New York Democratic Rep. Alexandria Ocasio-Cortez has no idea what causes illegal immigration, Democrats lie to protect Obama’s legacy, liberals lie that tax cuts pay dividends, and Mayor Pete has a one-sided feud with Vice President Mike Pence. Today’s show covers the stupidity of the last 24 hours. We discuss the latest immigration court ruling, Democratic California Rep. Eric Swalwell entering the 2020 presidential race, Indiana Mayor Pete Buttigieg obsessing over Vice President Mike Pence, former Vice President Joe Biden giving a sexual assault PSA, Vermont Independent Sen. Bernie Sanders wanting felons to vote in prison and Burger King’s apology for being culturally insensitive. Today’s show covers a lot of ground. The secretary of Homeland Security resigns, Democrats play the race card a lot, and nobody loves Barack Obama like Barack Obama. On the Friday edition of The Daily Daily Caller Podcast, we get into just how far left the Democratic Party has moved in the past couple years. Today’s show takes a new look at South Bend, Indiana, Mayor Pete Buttigieg, the current flavor of the month in the crowded Democratic field. Today’s show has it all: Joe Biden gets 2 new accusers, Bernie Sanders has no idea what hypocrisy is, Gillibrand doesn’t understand the destructive power of government, and high-paid journalists have no clue what journalism is supposed to be. Today’s show includes Democrats going even crazier. Joe Biden gets a second accuser, House Democrats create a non-scandal on security clearances, Rachel Maddow blatantly lies to her audience, and another day means another screw up from Alexandria Ocasio-Cortez. Today’s show is all about how far the Democratic Party has gone down the crazy trail. Joe Biden’s ‘pervy’ past has come back to haunt him, Bernie Sanders wants to control drug prices, and Ocasio-Cortez’s ignorance is unrivaled. On the Friday edition of The Daily Daily Caller Podcast, we take a look back at the amazing, news-filled week. We also have two interviews — one with The Daily Caller News Foundation’s Chuck Ross on the Mueller Report and how he managed to get so much of it right while outlets with giant budgets and staffs didn’t. And the other with Mandy Gunasekara, former EPA Administrator, who’s started a group, Energy 45 Fund, to advocate for President Donald Trump’s energy agenda on the Green New Deal and what it’s really like inside the permanent bureaucratic state. Today’s show gets into the left’s unwillingness to accept the reality that President Donald Trump did not collude with Russia to steal the 2016 election and did not obstruct justice. Liberal cable news channels are hemorrhaging viewers, but they’re sticking to their denials of reality. Also, there was the loveliest town hall on CNN, Rep. Alexandria Ocasio-Cortez isn’t happy (again), and former FBI head James Comey is upset. They’re all crazy. On the show today we get into the bizarre decision by prosecutors in Chicago to drop all the charges against actor Jussie Smollett, a decision that makes no sense until you realize just how politically connected he is. The Green New Deal had a vote in the U.S. Senate Tuesday and not one single Democrat voted for it. There are reasons for that, we get into them. And Joe Biden thinks we need to change our culture because it’s a “white man’s culture.” To make his point, the man whose famous for having difficulty with the truth told another lie; we have the story. Today’s show is all about the Mueller report and how Democrats and the media are dealing with their grief. It turns out, they still aren’t letting the facts stand in the way of their narrative. On the Friday edition of the Daily Daily Caller Podcast, we take a look at President Donald Trump’s executive order about free speech on college campuses, but that was not the most important part of what he did Thursday. Democrats cave to their radical anti-Semitic wing yet again, and a large percentage of Americans have no idea what the First Amendment is. Plus, in our video interview, we talk with Tim Carney from the American Enterprise Institute on his new book, “Alienated America: Why Some Places Thrive While Others Collapse.” The audio of the interview is included in the audio version of the whole show, too.